Volunteers gather in the Ohio Valley Christian School gym to prepare food for Haiti citizens in need. 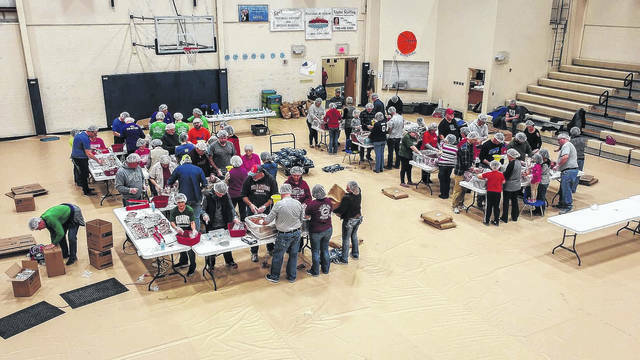 GALLIPOLIS — Like-minded individuals gathered in the Ohio Valley Christian School gymnasium Friday to pack around 57,000 meals for those in need in Haiti in an act of volunteerism and fellowship. According to OVCS Chief Administrator Patrick O’Donnell, between 250 and 270 volunteers assisted with the effort between 11 a.m. to 9:15 p.m. during packing day. Volunteer efforts packed roughly four pallets of food with 66 boxes on each pallet. Each box consisted of around 215 meals. Volunteers came in throughout the day to assist and some, many OVCS students, stayed throughout the day to assist. Pallets will then be shipped to Haiti. O’Donnell said Haiti was still in need after having endured by an earthquake and then a hurricane two summers ago. O’Donnell credited Blank as being the starting idea behind OVCS participation. Blank serves as a flight medic and as the school’s transportation director. The chief administrator said the coalition of volunteers for the food packing consisted of Fellowship of Faith Church, First Baptist Church, OVCS students, Mercerville Baptist Church Youth Group and Gallipolis Christian Church’s bowling team. Those mentioned either volunteered time, money or both. The Shake Shoppe and Dr. Kelly Roush also made financial contributions to the effort. Volunteers of all ages partook in the endeavor with some as young as preschool assisted by seniors in the packing process. Packed food consisted of a mixture of rice, beans, vegetables and soy protein along with vitamin enrichment. Packaged bags of six meals cost roughly $1.38. The chief administrator said that OVCS graduates Annee Carman and Emily Carman had both visited Haiti in the past as part of mission trips to observe and serve those living there. O’Donnell said volunteers were hoping to potentially double their meals to Haiti in the following year and invited any to come and assist in the effort.